Pari, the four year old child of my friends – Lalita and Samudra, recently acquired a phone fetish! She calls me almost everyday; and you should listen to her call or voice messages. They sound like she means business. Oh wait, she does. Her friend Mia wanted to do a lemonade stand and Pari jumped in. I was roped in as “a customer” and a few misfires later, a week ago, they did put out a stand. As promised, I was there to buy the produce. When I reached the stand I was greeted by a motley group of kids. I announced excitedly “wow, can I have a lemonade?”. But these kids were pros. Mia walked up, looked down upon me (even though she was looking up) and said, “you have to pay for it”. I immediately went on the defensive with “oh sure I will”. Joseph was the order taking guy, he grabbed my dollar bill and came back with two quarters (each glass was priced at 50 cents). And then he is asking the adults, “who should I give this back”? Hello, me obviously! The lemonade was good and totally worth the money. I saw the kids had gone back into the garage and were huddled over their earnings, trying to split into three equal halves. Perfect opportunity! I walked over and sat down on the ground beside them. Mia looked at me, and I said, “you’ll did a fantastic job”. She took the bait and replied “it was my idea!”. Which it was, so I gave her special credit for that. They had dollar bills, quarters, dimes, and many pennies. Total earnings stood at a grand $5.50. I bought another drink to make that $6.0 and ease the task of doing a three-way split. But that leaves out Olivia, the spaderunner. She looks at me, frowns (more than what you see in that photo) and says, “what is that hat you are wearing?” I replied meekly and hoped she will accept the explanation. Luckily, the jingle of money distracted her and I was spared. Soon we were all out, and I requested for a photo of Lemonade Inc. They were more than ready and also agreed to hold out profits and make a ‘V’ for victory. 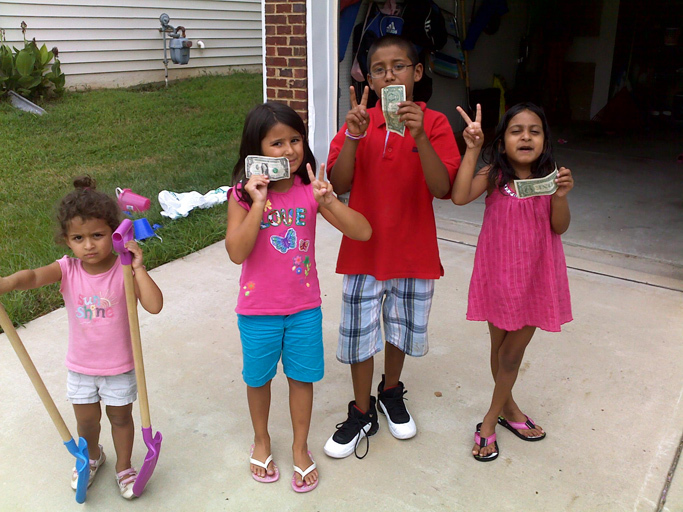 And they all shouted “money” when I asked them to smile. Yeah right, it is all about money, honey.